During their 16th annual meeting, held on 25 July at U.C. Davis, the trustees of the Asia Rice Foundation USA (ARFUSA) announced four 2015 winners of the organization’s Travel and Study Award Program. The objective is to help develop the next generation of young rice scientists. They are Jenna Reeger, pursuing a PhD in plant biology at Penn State University; Anuj Kumar, a Monsanto Beachell-Borlaug International Research Fellow doing research on rice drought tolerance and water use efficiency at the University of Arkansas; Anne-Marie Mitchell, a Peace Corps Volunteer (2014-16) in Benin under the Master’s International Program with Cornell University; and Hussain Sharifi, a PhD student in the Agro-Ecosystems Laboratory at the University of California at Davis. Ms. Reeger, a University Graduate Fellow, a Graham Endowed Fellow, and Roche/ARCS Foundation Scholar, is finishing her first year with Kathleen Brown and Jonathan Lynch in the Roots Lab, studying anatomical traits of rice roots and their genetic controls. Jenna is determining the influence of increased percent aerenchyma area and other root anatomical traits on drought tolerance in rice in greenhouse and field trials and comparing anatomical trait development and influence under drought stress between greenhouse-grown and field-grown rice. She is already attending IRRI’s 2015 Rice: Research to Production Course, 10-28 August, where she is learning the fundamentals of rice production and the key research concepts and methods employed in IRRI’s programs for rice improvement. She will be able to make use of that knowledge in her own research. She plans to return to IRRI to conduct detailed drought trials with Dr. Amelia Henry, IRRI’s drought physiologist. Mr. Kumar is doing his PhD studies in the department of Crop, Soil, & Environmental Sciences (CSES) at the University of Arkansas, Fayetteville with Dr. Andy Pereira as his major advisor. His project, Development and Characterization of Rice Genotypes for Water-Use Efficiency and Drought Resistance, is a collaborative research between University of Arkansas and IRRI. His aim is to screen the USDA rice mini-core collection for water use efficiency and drought resistance related parameters, generate and evaluate the populations (F2, BC1, etc.) from high-yielding, but drought-sensitive and drought-tolerant genotypes, and map QTLs for grain yield and drought-related parameters. His trip to IRRI will include participation in the international Molecular Breeding Course (28 Sept.-9 Oct.) and a continued stay at the Institute through Dec. 2015 to conduct some research training including work with Dr. Arvind Kumar, leader of IRRI’s rainfed lowland South Asia plant breeding group, for phenotyping of an F2 population (indica x glaberrima) and some other advanced lines. He will also learn other advance technologies to impose drought in the field. Ms. Mitchell is studying international agriculture and rural development while in the West African nation of Benin. As a volunteer, she is serving as the Rice Programs Manager for the 2015 Food Security Committee where she is developing informational rice manuals and resources and training fellow volunteers on best management practices that can be implemented in their respective communities. The aim of her project is to reinforce best management practices and to advance simple technologies through the discovery of the most effective tools for weeding rice fields. Through farmer experimentation, she hopes to determine the most suitable weeding instruments for the southeastern region of the country. With the assistance of the Union of Rice Farmers of the Oueme Plateau (URIZOP), the Collaborative Council of Rice Farmers in Benin (CCR-­‐B), and Farm Integrated Agricultural Solidarity (SAIN), 20 rice farmers from around the Oueme Department will be chosen to experiment with three different weeding methods: by hand or with a hand tool, with a cono-­‐weeder, and using a locally—made, ecologically—adapted weeder. This equipment is being financed by the ARFUSA grant. Before the start of the growing season in October, farmers will be chosen by CCR-­‐B and trained on best management principles and surveyed on their perception of rice practices and the overall experiment. As a part of the experiment, farmers will be asked to use 9-­‐12 rice plots, using 3-­‐4 plots per weeding method. Post-­‐surveys will be conducted at the end of the season (April-May 2016) to evaluate the advantages or disadvantages of each weeding method. 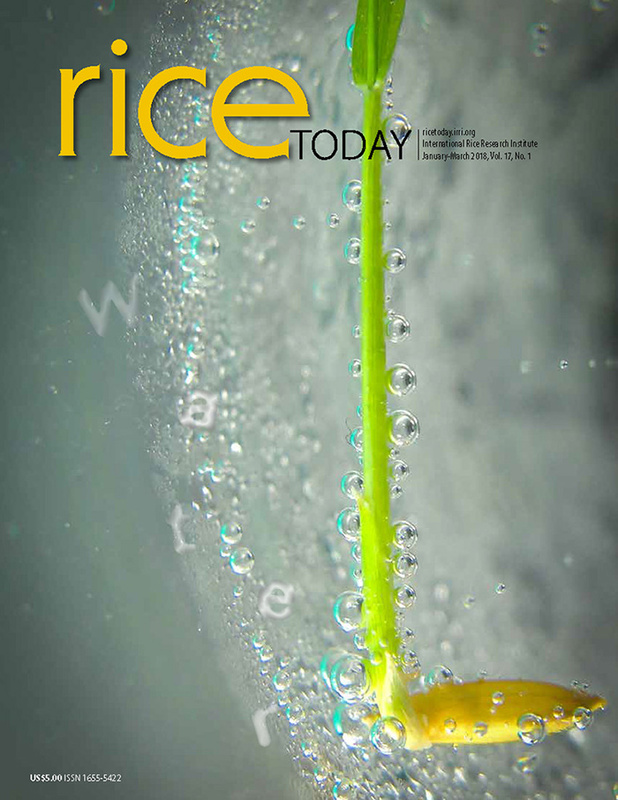 improvements in rice breeding, production, quality, and management. To this end, he is evaluating the effects of environmental factors (such as temperature, photoperiod sensitivity, and field management practices, including irrigation practices such as the alternate wetting-drying system) on rice growth and development. As a prominent part of his research, he has tested the accuracy of Oryza2000 and CERES-Rice, widely used rice crop growth models, under these environmental variables. The accuracy of these models under varying environmental factors is essential to efficient rice crop management—and consequently yield and profitability—in the face of climate change. Not wasting any time, he has already arrived at IRRI to attend the 2015 Rice: Research to Production Course, which ARFUSA is funding for him. Particularly interested in crop modeling, he will also be conferring with Tao Li, IRRI’s crop modeler.